Nestled amongst the limes, lemons, and oranges of Joe’s fruit bowl was an avocado. I think I heard him say something like “I’m tired of ‘vacation cocktails’, but I really want to make a blended drink”. Then I saw him reach for the avocado, and watched as he scooped out about 1/4 of it into the blender, and so we started constructing this little number. That night I had brought over an infusion made with tequila and cayenne peppers. I really enjoyed the bird’s eye soju infusion we had made for Thai week, but I knew that tequila would have been a better match. Joe recommended using a reposado tequila, which was a great idea. Since I had decided to work with tequila, I thought I’d choose a different pepper, and so I selected several mild-looking cayenne peppers and submerged them in tequila for a few days. I also threw in a tablespoon of agave nectar, as I’ve found that adding a small amount of sweetener can really help an infusion pop, and agave and tequila harmonize perfectly together. Let infusion for 2 – 3 days, tasting regularly. Remove peppers as soon as you taste the burn. Avoid over-infusion. I was careful to taste the concoction regularly as I was afraid it would become too spicy. After two and half days or so, I grew impatient, surprised by how mild the infusion was, and decided to add another pepper. It must have been a particularly spicy one, however, as the next time I tasted it I knew the infusion had to stop immediately. Maybe it had even gone on for too long, so let this be a lesson for you: chilis are unpredictable. Some are hot. Some aren’t. I don’t know how to tell them apart, and if you have tips, please share them with us by dropping a comment. We had been telling ourselves all night that’d we get around to using it, but so far we had been struggling to find a drink for my spicy tequila. Naturally, avocado and tequila go well together, and so finally its time had come. We decided to use it as a modifier, to add some spicy kick to a drink, since my infusion had come out so hot. I can’t quite remember where the idea to use both tequila and mezcal came from, but I want to say it was because we wanted to make some sort of Mexican tiki drink. Most tiki drinks use two rums, so why not two “tequilas”? The rest of the drink kind of built itself, as I said before, agave nectar and tequila are partners in lime. As we tasted the nearly finished drink, we realized it needed a pinch of salt. Joe was going to use regular kosher salt, but I jokingly urged him to use some fancy artisan salt. “We’ve got a blended avocado, some cayenne pepper-infused tequila, mezcal, fresh lime juice, agave nectar… Keep it craft, Joe. Keep it craft.” And so we did. Blend thoroughly over ice and pour into a cocktail glass. Garnish with a lime wheel. 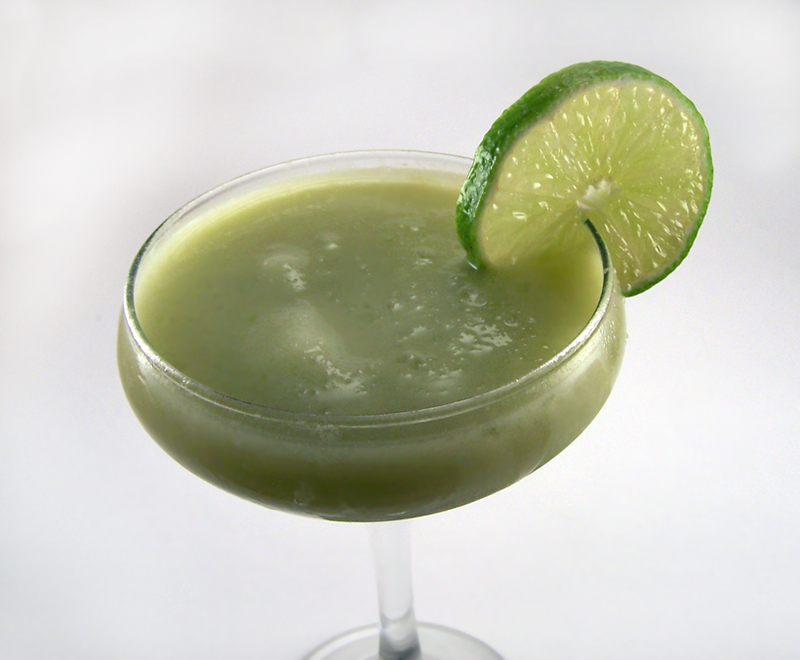 The avocado gave the drink a nice, rich texture, similar to a blended piña collada, only slightly creamier. The spice from the chili-infused tequila and the smoke from the mezcal pierce through the mellow avocado, reinforced by the agave nectar. The pinch of salt helps to tone down the avocado a little bit, so be sure to include it, if you make your own. Indeed, it was a great blended drink without being a rum/tiki/vacation drink, and I can’t wait to make another. Categories: infusions, modern drinks, original creations, tiki | Tags: alcohol, avocado, bartending, blended drinks, blender, booze, cayenne pepper, cocktail, cocktails, craft cocktails, drinking, drinks, infusion, lime, mezcal, mixed drinks, mixology, reposado, tequila, tiki | Permalink. Another nice “same culture” pairing.